Mass General is leading the way in digital pathology, the technology of converting conventional glass slides to images that can be stored in a computer. Mass General is a leader in the field of digital pathology, which increases the accuracy of diagnoses from biopsies and expands what they can tell us about patient health. Imagine you are a patient at a rural health facility. Your doctor is concerned you may have skin cancer. To be sure, she needs to take a skin tissue sample (a “biopsy”) and store it on a glass slide for evaluation by a pathologist. But unfortunately, the clinic you are in does not have an expert skin pathologist on staff, so the biopsy must be sent away to another facility for review. This method is time-consuming, and it can also lead to incomplete and inaccurate diagnoses due to decay of the sample over time and the handling of the sample by multiple people. Digital pathology — converting glass slides into images that can be stored in a computer, and that look the same on the screen as they do under a microscope — can change the way patients are diagnosed and treated. Massachusetts General Hospital is a leader in this field, increasing the accuracy of diagnoses from biopsies and what can be learned about patient health. Digital pathology can change the way patients are diagnosed and treated. Another Mass General pathologist, David C. Wilbur, MD, director of Clinical Imaging and professor of Pathology at Harvard Medical School, is part of the development team responsible for creating digital screening technology currently being tested for use worldwide. Right now, the accuracy of a pathology report depends upon highly trained doctors reviewing each slide and providing context based solely on the contents of the slide. But this is changing rapidly through the use of Big Data — incorporating everything that is known about a patient’s medical history to develop early diagnosis and more accurate, effective treatments. Dr. Louis believes the most powerful advancement in digital pathology will happen when all tissue samples are converted to digital images that can be easily examined by a doctor in coordination with a patient’s lab tests and genetic information. In addition, the information contained in the digital pathology images themselves can lead to the discovery of clinically relevant conclusions that may be beyond the reach of standard human “visual” examination. Dr. Gilbertson also leads the Pathology Informatics Fellowship Program at Mass General, which teaches these approaches to the next generation of pathologists. The advancement of digital pathology means more efficient transfer of data from doctor to doctor. All of these developments in digital pathology are working towards the same outcome — faster, more accurate diagnosis and treatment for all patients, wherever they are. On a weekly basis, Mass General hosts conferences that bring together doctors and pathology teams from every corner of the globe to review digital images, address technical questions and share experiences in the field. Thanks to Mass General leadership, the implementation of new pathology analysis methods in places as diverse as Peru, Pakistan, China and Iraq is enabling the global medical community to connect in ways that will benefit the future of medicine, the study of disease and the advancement of biomedical research. For Mass General patients, and patients around the world, the advancement of digital pathology means more efficient transfer of data from doctor to doctor. It means it’s easier than ever to get a second opinion from a doctor not in your immediate area. And, most importantly, it means faster, more accurate analysis and more personalized treatment. By offering your support of the MGH Fund today you’ll help make advances in medicine and high-quality, patient-centered care not just a reality for Mass General patients, but for people around the globe. Please give generously to support the MGH Fund. 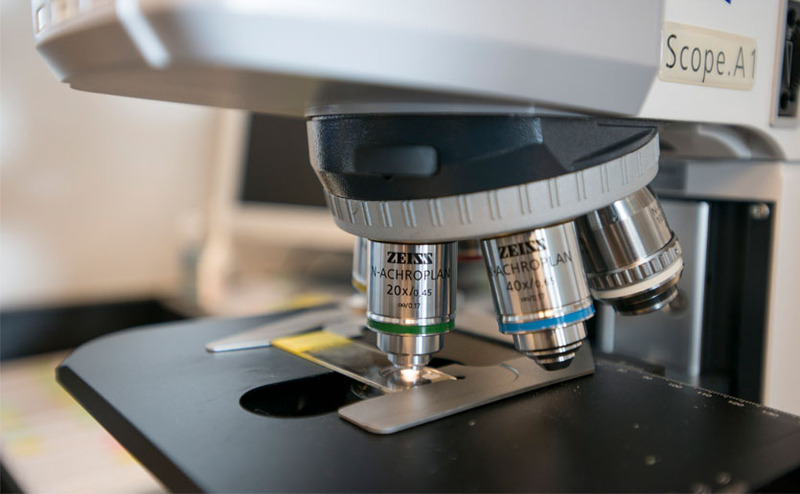 The MGH Fund is an important source of funding that allows Mass General to stay at the forefront of innovation in areas like digital pathology.